In his video titled Un Cercle autour du Soleil/A Circle Around the Sun (2005) Ali Cherri, who experienced Lebanese civil war (1974-1991) during his childhood and adolescent years, reconstructs ‘Beirut’ where war was almost an ordinary element of everyday life and the war experience was not necessarily described as ‘traumatizing’ and an unexpected feeling of unsafety he faces after the war was over. Although, especially in big cities, going from one place to another could be considered as a journey on its own, most of the times the destination and afterwards preoccupy the passenger during the travel. Nur Muşkara’s photographs document a kind of witnessing that we all experience everyday in the city however perhaps could only attest if photographed. 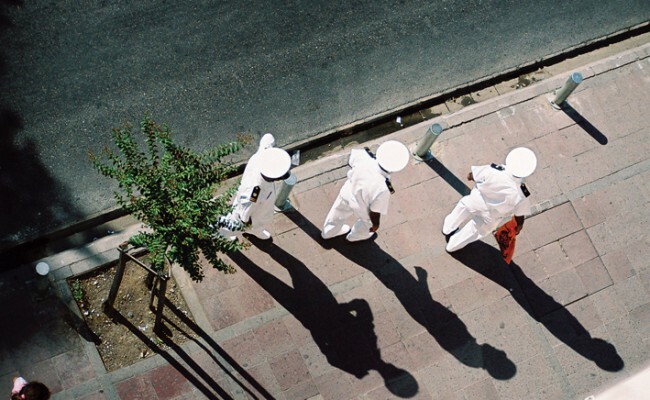 The photographs Muşkara has produced in Izmir and perhaps the act itself, photographing the ordinary details which are already forgotten when seen, tend to inspire a sense of surreality. Ali Cherri, Beirut, 1976, graduated from Graphical Design, American University in Beirut (2000). Completed gradute studies in ‘Performing Arts’ at DasArts (Amsterdam). There he produced, “As Dead as Ever” (lecture/performance, 2002) ,RedRum (video installation with Guy Amitai, 2003) and “Un Cercle Autour du Soleil” (video,2005) (FAAP digital arts award VideoBrazil, Sao Paulo - Brazil). He exhibited “Give me a body then”(performance, 2005) at Diskurs 05 – young performance art festival Giessen – Germany and at ‘Home Works III – a forum on cultural practices’ Beirut. Currently he attends an art residency program at VidoeBrazil ,Sao Paulo. Nur Muşkara, lives and works in İzmir. Started her education in Ankara' and continued in Paris. Graduated from Dokuz Eylül Üniversitesi Fine Arts – Painting in 2004. 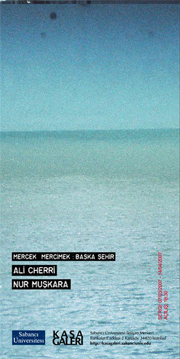 2006- "Değişirsem Korkma". Solo show.. K2 Oda sergisi. Kardıçalıhan- İzmir. 2006- "Sıradan Yansıyanlar". Proje: Philippine Hoegen, Sylvia Kouvalis. K2 Sanat Galerisi. Kardıçalıhan- İzmir. 2006- "Misafir Odası/ Proje 03". Proje: Dokuz Eylül Üniv. Öğretim Görevlisi Borga Kantürk. Ege Üniv. Atatürk Kültür Merkezi- İzmir. 2004- "Çatı" Karma sergi. Proje: Dokuz Eylül Üniv. Doç.Murat Özdemir. Kardıçalıhan- İzmir.